We were approached by the Business Development and Corporate Strategy team within Barclays to design and deliver a student workshop around their expertise. The team wanted to share their knowledge and skills with local students and to inspire them to consider a career in Mergers and Acquisitions. The interactive and engaging workshop included an introduction to Barclays, followed by a simulation activity where students, supported by employee volunteers, had to research companies to acquire and conduct a Risks and Rewards analysis before presenting their recommendations. Develop employability skills including: team work, communication, presentation and critical analysis. Increase their understanding of business terminology and processes. Increase their knowledge of exposure to career paths in Barclays, specifically in the specialist field of M&A. Support in schools local to the regional offices of JP Morgan, A J Gallagher, ADM (UK) Ltd and Lloyd’s. Over the past three years we have worked with several partners to establish education and employment programmes for regional offices, including Archer Daniels Midland (ADM), AJ Gallagher, JP Morgan, and Lloyd’s. We acted as a Relationship Manager, brokering the initial relationships between the business and the school, provided DBS checks and training for volunteers and support to establish and maintain successful partnerships throughout the academic year. For example, since 2015, we have been working with employees from Kent and Essex based ADM (UK) Ltd, the world’s largest agricultural processors and food ingredient, to deliver our flagship employability programme, Getting Ahead, in secondary schools local to their offices. Commenting on ADM’s involvement in the event, Martin Farrow, General Manager, said, “ADM is committed to supporting the employability of young people in the local community…It is a pleasure to work with the students to provide them with a much-needed opportunity to develop an awareness of the world of work and an insight into local employment opportunities with a global employer. ADM staff thoroughly enjoyed supporting the students and helping them to kick-start their journey to employment”. Several of these schemes continue to this date and are supported remotely by us. 28% worry about their children asking them questions about money that they themselves can’t answer. Two fifths of parents (41%) admit they don’t talk about money management with their children. We worked in collaboration with Quaker Social Action (QSA) to develop ABACUS – a family financial literacy project engaging children and their parents in Tower Hamlets. 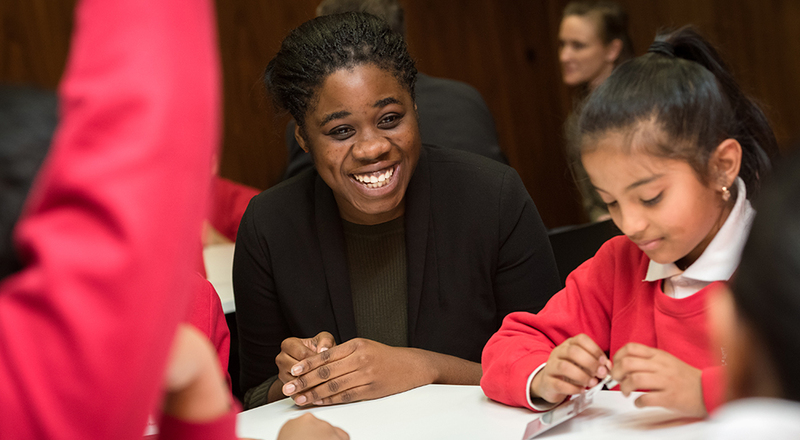 In a series of six workshops, Year 5 children and a proportion of parents concurrently explore the practical and emotional aspects of managing money, learn about financial products and concepts (including insurance) and engaging with the world of work. Insights for the future workforce about career pathways in the insurance industry, including work experience placements. A longstanding volunteer with Tower Hamlets Education Business Partnership contacted us to help her establish a Career Insight Week at her employer, Chubb. Four lucky students were selected to undertake work experience placements to explore a variety of Chubb departments such as marketing, operations, HR and finance supported by Chubb employees. “Chubb were delighted to partner with Tower Hamlets EBP for this hugely valuable and important work experience scheme”.